Britain tells Abbas the PA now is a “mission” and not a “delegation” in London, easing visa requirements but not granting diplomatic immunity. Britain told visiting Palestinian Authority Chairman Mahmoud Abbas that it is upgrading the status of the PA from a “delegation” to a “mission” in London, easing visa requirements but not granting diplomatic immunity. The mainly symbolic change is another diplomatic plum for the globe-trotting Abbas, who flew to London on Monday to win international recognition of the PA as an independent state without having to talk with Israel. He will leave Britain for Denmak before flying back to Ramallah. Britain follows France, Ireland, Spain and Portugal, all of which have granted the PA the status of a “mission,” while Norway has given the head of the PA delegation the rank of ambassador. The United States upgraded PA status from a "bureau" to a "special delegation" in July 2010, allowing the PLO flag to be flown. 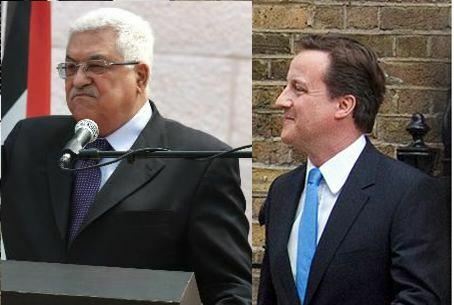 Abbas spoke with Prime Minister David Cameron and Foreign Secretary William Hague to “address the situation in the Middle East, the faltering peace process and Israeli settlement activity as well as the upcoming meeting of the Quartet," according to Abbas’ spokesman Nabil Abu Rudeina. The discussions are a promo for a meeting of the Quartet – the European Union, Russia, the United Nations and the United States – in Paris later this month. Abbas has refused all offers to sit down with Prime Minister Binyamin Netanyahu for direct discussions until Israel freezes all construction for Jews in Judea and Samaria. He also has rebuffed all suggestions that he recognize Israel a “Jewish state,” a definition that would undermine his aim of flooding the country with approximately five million foreign Arabs claiming Israel as their home. Britain, like U.S. President Barack Obama, has backed virtually all PA demands that it be declared an independent country with a border that would require Israel to surrender all of the land restored to it in the Six-Day War in 1967, including areas that house approximately 600,000 Jews in Jerusalem, Judea and Samaria.